Did you know that you can use Trisul to offer subscriber reports ? You can setup Trisul to monitor subscribers from a central location and then provide each subscriber a web login to view their own reports. You can use this to build a value added service offering. This page describes how you can accomplish such a setup. Trisul needs to monitor traffic to all subscriber networks. There are a few options you can choose from depending on your service topology. If this subscriber has both static IPs and netflow interfaces turned on, only specify the interface. The IP will be automatically considered for reporting. Specify an initial password, you will send this to the user can then change it. If you want to allow multiple logins from the user, check this box. This depends on your overall service offering. Press Save and complete the task. Now you can send the username + password to the subscriber. The subscriber upon visiting the Trisul login page will enter the username and password you have created for him. The user can select a different service or a different day using the easy to use drop down lists. The following screenshot provides an idea of what the user sees. The report includes the following. A typical screenshot of what a subscriber might see upon logging in. Click on the PDF link to generate a PDF report. A subscriber can select a static IP from a dropdown list and view detailed flow/conversation level reports. The screenshot below shows an overview of the kinds of things he can view. Can we upload subscriber data in bulk ? It is possible to create users from a text file or provisioning database. Please contact Unleash Networks for a quick script to do this task. What is better Netflow or raw packets ? Netflow will scale much better than raw packets and will provide comprehensive reporting. If you plan to offer advanced reports that include security analysis, then feeding Trisul raw packets is better. Can you provide reports on IPSEC/VPN tunnel service ? 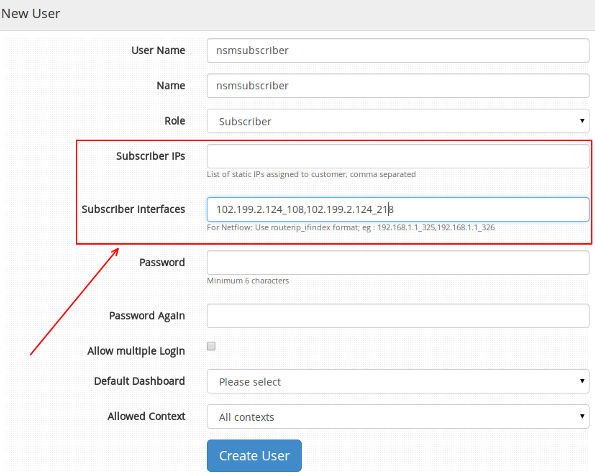 Subscriber can login and view their service details, except that Trisul will not provide internal host/app data. I dont offer static IP, rather offer DSL/Cable. How can I setup subscribers without an IP ? Export netflow from the DSLAM router where each service shows up as a logical interface. Can I offer more advanced reports with drilldowns ? You can also run a complete instance Trisul as a separate context. This will allow the user to drill down deeply into his traffic. You may offer this as an enhanced reporting package service.